Ever since Revent delivered the very first rack oven in 1958, Revent has been committed to the quality of their products. Pioneering innovations over the years have laid the foundation for Revent’s sales success and market leadership the world over. But Revent wants to do more than offer an oven of the highest quality built according to the market’s leading technology. The aim of Revent’s efforts is to make every day a little easier for their customers and offer the functions they need to be successful in their business. This is why Revent offers a top-of-the-line oven customers can depend on, day after day, year after year. An oven that bakes bread so good their customers will go out of the way to buy it. An oven with low operating costs that will generate a profit at the end of the month. Picard Ovens Inc. has been manufacturing ingenuity since 1957. For the past 50 years, Picard has had a constant focus on improving customers’ productivity and profit margins. It’s no wonder that Picard is so well known throughout North America for producing the finest ovens in the industry. It’s because Picard sets the highest standards for design, energy-efficiency, manufacturing quality and customer service. 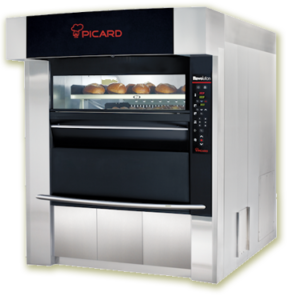 Take a look and see why Picard Ovens are fast becoming the oven of choice for so many bakeries and pizzerias across the nation.